How pleasing it is to the eye — aesthetics It ‘works’ in as many ways as possible — practicalities It satisfies most, if not all, of the owner’s requirements — themes. There are many factors that a designer has to consider before achieving these, but most fall into two main groups — the aesthetics and the practicalities. Practical considerations are straightforward — if an archway is too low, people will hit their head on it. Aesthetic considera­tions are less straightforward — the timber used in a particular archway looks too thick for the size of arch. This is prob­ably a matter of opinion. One of the easiest ways to explain aesthe­tics is to consider whether or not some­thing looks or feels right. After all, it will be judged by ordinary human beings. An early decision which has to be taken is what mood or style the garden will have. It could be very formal with lots of geometric shapes and straight lines, or informal with curving lawns, borders and paths. There are, of course, plenty of stages between. Oddly enough, the in-between stages, which could mix various styles together, often require the greatest skill to create. Examples of good mixtures are often seen inside buildings where you might have a very old converted barn or cottage but modern, brightly coloured door handles and modern lighting all used to great effect. Mixtures between old and new, formal and informal, can also be achieved in a garden. The two very basic styles of garden (formal or informal) can be accentuated or tempered by a great many influences. The type of planting or paving used can produce certain ‘moods’. Two factors which play a large part here are colour and texture. Both these terms are well known in connection with house furnish­ings, whether they be textiles, ceramics, wall surfaces, etc. A garden designer must be alert to the various colours and textures which are present in all the materials which go to make up a garden. Take the case of where a very rigid, formal layout with mainly symmetrical features has been applied to a simple rectangular plot. In one instance, imagine this garden to have white rendered walls 1.8 m (6 ft) high, light coloured smooth paving perhaps incorporating a formal pattern or motif, borders of brightly coloured plants with a number of specimen yuccas, phormiums and grassy plants. Instead of a lawn there may be stones or gravel. The general effect will be along Mediterranean lines. Now imagine the same area (with the same layout) surrounded by creeper-clad wooden fences. The paving may be brown in colour with a rustic or riven surface. The borders are planted with soft plants in restful greens, greys, pale blues and perhaps pink. Instead of stones or gravel there is lawn. Despite the iden­tical layout, the effect will be quite differ­ent. These effects or ‘moods’ are governed very much by the colour and texture of the materials which have been used. Plants in particular have a lot to offer in these respects and the designer must be on the constant lookout for interesting and useful qualities in plants, quite apart from any practical considerations. Simi­larly with paving, walling and other constructional materials, the choice will be made partly on colour and texture, partly on practical grounds and, of course, partly on financial considerations. These two aesthetic factors are often difficult to define, partly because they can both become a matter of opinion. The illustrations highlight a few examples but what looks right to one person may not look right to another. Proportion and balance play an important part when it comes to dividing up a garden into areas of plant, paving, grass and so on. I have seen an initial layout drawn over graph paper or a grid and although this approach can be helpful there is a danger of these rigid lines directing thoughts in very predictable directions. When I embark on this initial drawing and proportioning, I look at the area as a whole and decide which parts of the garden should become the focus of atten­tion. This may well be in response to a view from an important window or door. If the garden happens to be very shallow or short and needs lengthening or enlarging visually, it may be necessary to position a feature in one of the further corners, thus accentuating one of the largest possible vistas in that garden. This would then create a diagonal axis and the rest of the garden layout would somehow need balancing in order to sympathize with this approach. It might even be necessary to angle paving next to the house and to orientate other garden features or buildings accordingly. Around the outside of most gardens is evidence of the surrounding area — buildings, trees, telegraph poles, moun­tains and so on. Some of these may need hiding or perhaps accentuating and the initial basic layout would have to take this into account. This is an often neglected dimension in a garden. Height can refer to the height of trees, boundary fences, hedges, terracing of the ground and subsequent steps, raised beds and any other features which will rise above the general ground level. Balance and proportion will have to be applied to all these so that they end up looking right. For example, if a group of three new trees was going to be viewed from one side only, it would be an advan­tage to start off with them at different heights with the tallest one furthest from view. For some garden structures (including steps) there are aesthetic formulae to help the designer. Having studied these, I am not impressed with the results and prefer to be less rigid in the way I arrive at the end result. Trial and error on the drawing board (working to scale) is always very helpful. A garden which is crammed with num­erous little features produces quite a different feel to one which is plain and simple. There are circumstances in which either can be satisfactory but there is no doubt that it is better to limit the variety of surfaces and features in any one area, or at least to ensure that only a few are visible from any one point. Even if many materials or features are included in a small area, it does help to have one mat­erial or theme running throughout the area giving a degree of unity. A common example seen inside a house is where the same style or colour of floor covering runs through various rooms. Apart from giving an impression of spaciousness, it does unite the various rooms and their themes. The same effect can be achieved in a garden by the use of grass or some forms of paving. Practicalities of design are easier to explain because of their functional nature. A garden has to be lived in and looked after. To these ends it must ‘work’ and not just look pleasant. At an early stage in the design, the posi­tion and size of various features will need determining from a practical point of view. Potentially sunny areas are of special interest, since so many features require as much sun as possible: sitting areas; greenhouses; conservatories; fruit and vegetables; most flowers; rockeries and, to some extent, water features. Unfortunately, most gardens have only limited areas of sun, which presents the designer with a challenge. A patio or sitting area needs sun for most of the day (another sitting area may be needed, however, for those who like some shade). If a barbecue area is involved, some evening sun is desirable. If the patio receives sun only for a short while, a garden seat could be positioned elsewhere to catch the sun at a different time of day. A swimming pool not only needs plenty of sun but also needs to be positioned away from trees prone to dropping their leaves. If a greenhouse is to be used to raise seedlings very early in the year, good light is essential. Vegeta­bles, fruit and many flower crops resent overhanging trees but shade from walls or fences is less critical, though not ideal. Areas of the garden which receive little or no sun can be used for sheds, compost heaps and as general storage areas. Areas of grass which need regular mowing should be shaped so that a mower (especially if you have one with a front-mounted grass box) can reach into every corner. The shape of grass areas which need only occasional trimming and which, as a result, may accommodate bulbs or wild flowers, is less critical since these difficult shapes or corners can be ‘strimmed’ rather than mown. Borders that are very wide may be difficult to look after, even though it may be necessary to have them that wide for a particular reason. Some form of access will be useful down the back of these borders for maintenance. Hedges need regular trimming and those which border farm fields or untidy neighbouring gardens may harbour perennial weeds. Here again an access path is useful, particularly if it separates a newly planted border from the hedge. These and many other practical points are highlighted in the various examples of garden layouts, so even if a particular layout does not suit your needs, it is worth looking through them for more general design hints. 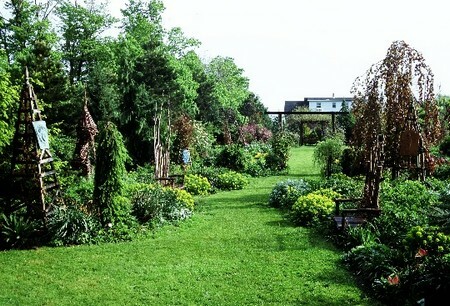 Many gardens feature a special theme in addition to the more general ‘formal’ or ‘informal’ setting. The idea of dividing a garden into smaller partially secluded areas is always generally popular. 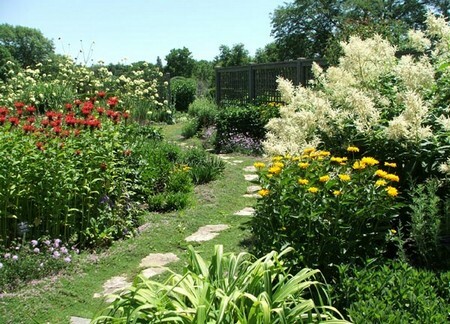 In addi­tion, some of these areas can support a particular feature, such as a herb garden, rose garden, water feature and so on. Informal layouts with curved borders of shrubs and flowers are especially suited to divide up a garden. Areas can be connected by paths, pergolas, arches, timber walkways and other means. Formal gardens can also be divided up (in a more geometric way) using hedges, walls, trellises and various screens. If a sloping garden is terraced, each terrace could display a different theme. This does, however, need to be done with care otherwise there may be no unity between the areas and the overall garden could end up as several smaller ones with no common purpose.